In this online money game, students will learn the names and values of different US coins and bills. This activity is a drag-and-drop game in which kids will match the pictures of different coins and bills with the money values written in decimal forms. 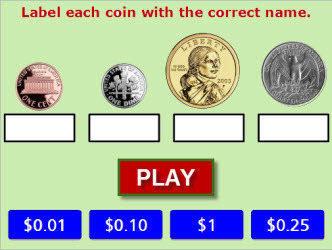 This game provides elementary students with multiple opportunities to identify the correct value of different coins and bills. This is a graded quiz with 10 drag-and-drop problems. This game can be played on computers, iPads, and other tablets. You do not need to install an app to play this game on the iPad. Have fun matching different US coins and bills with the correct values! Return from the Coins and Bills Game page to Money Games or to Math Play homepage.